Joseph Parker (12-0) takes on once beaten American Anthony Pettaway (17-1). A good crowd has stepped out to see the hometown hero, and in this case it’s quite literally that. Parker is fighting 10 minutes away from where he grew up before shifting to Las Vegas to pursue his boxing career under the guidance of Kevin Barry. An ensemble of sporting celebs and local fans are in attendance, including a guy that’s found fame for all the wrong reasons. 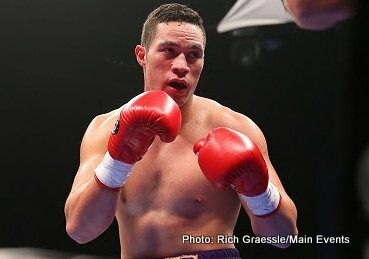 Joseph Parker has given a front row seat ticket to a chap named Teina Pora. Pora did over two decades of jail time for a heinous crime he has being judiciously absolved of. A long time to serve for a crime you didn’t commit. Not boxing news but a nice touch by Parker and his team. Good stuff. Have to say Duco run a slick promotion, everything appears to be running seamlessly. Kevin Barry looks like his animated all-business self as he and Parker make their way to the ring. Parker looks as calm as a cucumber. Pettaway too looks calm, like he’s on a Sunday stroll to be fair. Stare down – Parker looks all business, Pettway not engaging wholeheartedly in the stare down. Parker comes out looking to establish the jab. Looking to assert himself early. Very quick hands for a big man. Parker trying to make the fight, full of beans, trying to impress himself physically on Pettaway. Pettaway not offering much, looks like he’s trying to work out a way to deal with Parker’s speed. Not sure if he has the tools to solve the quick hands riddle i.e. timing, head movement and a willingness to engage. Pettway clipped, he tasted Parker’s power clean and didn’t like the taste one bit!! Round 1 – end. Parker round definitively, 10-8. Parker using his jab well. Touching up Pettaway with it in setting the range. Parker’s jab on its way to being a world class weapon. Parker dominating on every level! Pettaway affects a kind of bull rush at Parker head first, almost like a rugby tackle. Not classical boxing method and absolutely ineffective. Parker landing heavy blows with both hands!! Pettway gets on his bike and he’s pedaling fast! Parker coming on looking to get Pettaway out. Pettway is either going to have to work out a way to offset Parker’s jab as it’s causing him problems all over town, or keep getting set up for the right hand down the tube – dangerous. Pettway not liking Parker’s power one bit and he doesn’t have a game plan to offset it – ominous. Round 2 – end. Parker round definitively, 10-8. Parker quite simply too strong. Pettway cautious, aided by the fact he is getting overpowered, out-hustled and can’t deal with the speed of Parker. Not looking good for him, a KO almost a matter of course. Parker showing a good shot selection off of the great groundwork from his jab. Parker lands with some huge body shots. Those shots will be draining the air out of the tires. Pettway down! Ref counting, he makes it up! And gets on his bike again!! Round 3 – end. More of the same. Parker just has too much for Pettaway. End is nigh. Don’t think this fight will get out of round 4. Running a scorecard is a pointless exercise. More of the same, Parker clips Pettaway with a great right hand, follows up with both hands, unloading against Pettaway who is backed up against the ropes. Pettway down, Parker clips him while he’s down, Pettaway’s corner look to be complaining about that shot, not deliberate. Parker not a malicious fighter in any stretch. Round 4 – fight over by KO at 2:11. Pettway was simply overpowered by the younger, stronger and quicker Parker. Pettway looked disinterested once he tasted Parker’s power. Power is a handy way to dissuade an opponent. Parker admits to trying too hard to make the fight but that’s what makes the guy great to watch. Parker moving on to bigger and better things. Next boxing news: Patrick Nielsen ready for war!